I posted my observations about temperature, it's relationship, and how I sensed it was affecting my shrimp. Several people commented that they appreciated it since there aren't a lot of people here that are keeping them. So I thought I would start a thread to share some of the other things I'm learning now that my bamboo shrimp experience is in full swing. Maybe I can even convince a few of you to get one! DISCLAIMER: I'm not a scientist or a professional aquarist. This stuff is based on my own observations and some stuff I've read on the internet that is supported by those observations. I AM NOT AN EXPERT. First of all, if you're not sure what I'm talking about, I'm talking about atyopsis - a "filter feeding" shrimp. 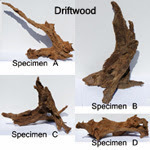 At your LFS, you'll see them referred to as bamboo, wood, or flower shrimp. They might also be referred to as Singapore shrimp. They're different from a lot of other shrimp in that they don't have claws, they have 4 feathery front "arms". Rather than killing (like crayfish) or picking (like algae-eaters) with claws, they use their feathers to filter micro-organisms from the water. Here's a picture of mine. The girls call him Pierre. The picture isn't great, but it does show his filters in action. The only real advice I can give if you are thinking about getting a bamboo shrimp is to remember that he's not a fish. Of course, that fact is probably why you wanted a shrimp in the first place but the flip-side is that you have to treat him differently, too. Fish get sick once in a while, and one of the most common issues is probably Ich. In general, medications that treat Ich and other similar parasites contain things that will KILL your shrimp. Copper and other heavy metals are toxic as are many other substances. If you already use a hospital tank for treating fish disease, you're in good shape. But if your used to just dosing your tank, it gets more complicated. Otherwise, you might consider products such as Herbal Ich Attack, which although not a strong anti-Ick treatment, it is also safe for Shrimp. Water quality is always critical but it seems to be even more so with shrimp. They're extremely sensitive to ammonia. And as I observed previously, low dissolved oxygen is much more apparent with shrimp than with fish. Be careful when doing water changes and cleaning your tank. I've noticed my shrimp is also much more sensitive to stress than my fish. Absolutely DO NOT remove all your ornaments while cleaning your tank. These guys want places to hang out. A bare tank is a sure way to stress them to death. A happy bamboo shrimp will eat almost all of the time. But this doesn't mean you'll see them feeding like you would other shrimp. If a bamboo shrimp is getting enough to eat in my experience, they won't move for long periods of time (even DAYS). They'll sit with their filters deployed and eat continuously by putting the filter in their mouth and pulling debris off of it. They depend on their food coming to them (via water currents) much more than fish. If your shrimp is picking the substrate, even though it seem like normal behavior for a shrimp, it's actually not good - he's probably not getting enough to eat. Make sure you have a spot where they can set themselves in the current and they should do well. On the subject of starvation, you might be tempted to give more fish food, in an effort to feed your shrimp. If you have livebearers like me, all you'll end up with are super fat fish and a shrimp that still isn't getting enough to eat. Also, over-feeding can lead to poor water quality which can create a whole host of problems. Also see my comments in the next bullet regarding scavenging. Livebearer Fish Information, Guppy, Molly, Play, Swordtail, Endlers"
I have a 55G tank with several fish. Bamboo shrimp are omnivorous. If you have a setup like that, you shouldn't need to feed your shrimp separately very often. They should get enough to eat from decaying fish waste and other small organisms in your water. I should be more specific about scavenging. These shrimp are NOT scavengers in the sense that they'll pick through the substrate looking for leftover fish food. In fact, if they're doing that, they're probably STARVING. In the strictest sense of the word, scavenger means an animal that feeds on dead or decaying matter and a bamboo shrimp certainly does that. They just do so PASSIVELY (filtering the water column) whereas I think a lot of people hear scavenger and think of the raccoon in their garbage or a vulture picking at a deer on the highway. It's still fun (if not necessary) to give treats once in a while. To avoid issues with the fish, I use a medicine dropper and introduce "treats" to my shrimp directly rather than putting it in the water where the fish can get it first. I also try to give my shrimp supplements that are less enticing to the fish in general. I've found if I crush bloodworms into a fine powder, the fish ignore them but he loves it. I also feed small amounts of frozen plankton (copepods) by mixing a small chunk with tank water and squirting it near him. The fish like these too, though, so I have to be careful. I did stumble onto another off-the-wall treat that he REALLY enjoys. When I bought my tank, the LFS guy gave me some powder called BioZyme to start my tank. It didn't work, I'm guessing because powdered bacteria are pretty dead. I ended up using liquid Turbo Start (my tank cycled within 48 hours of adding it) and I've had this BioZyme sealed in a tube ever since. Out of curiosity, I mixed a TINY bit of it (the size of a BB maybe) with water and squirted it at him. I've never seen him eat like that, he went crazy! That being said, I have no idea if feeding my shrimp TANK STARTER BACTERIA is a good idea or not. I wasn't going to use it for anything else, so I thought I would try it. One of the things Carl always preaches here on the boards is that proper mineralization is important if you want healthy fish. For shrimp and other invertebrates with ecto-skeletons, it's absolutely essential that you have good mineral content, especially calcium. Bamboo shrimp molt and need calcium to build a new shell. Mine has already molted twice in about 8 weeks and I've read similar stories elsewhere on the internet. All of our water around here comes out of limestone aquifers, so for me it's not an issue. If you have soft water, make sure you are adding minerals, especially calcium. Speaking of molting, make sure your shrimp has a place to hide. I have never observed my fish attacking him, but while molting they're super-soft and vulnerable and could be damaged beyond repair. While I've never seen my fish bother the shrimp, I HAVE seen the shrimp attack fish. It's actually harmless and quite funny. His feathers are completely harmless - again, they're not claws in any way. He's fairly aggressive (he jumps at me when I come to the glass LOL) but it's all for show. Finally, I have observed a quite peculiar and fascinating behavior. When he's using all 4 filters to feed, he uses them in an exact order. If the first filter to go into his mouth is the bottom-right one, the top-right is next. I've sat for as long as 15 minutes at a time and watched him feed in this strict linear pattern. It's hilarious. My daughter and I have observed him for literally hours over the past month and he might break his sequence once or twice every 50 iterations. Just another little thing that makes this things so much fun! For purchasing, I don't use the same process I use with fish. Shrimp are SO fragile and because of that, I don't really feel they're subject to the same kind of hidden problems you get with fish. Again, this is my own personal opinion and not in any based in fact, but for me, if a store has a half dozen shrimp and they're active and using their filters, that's good enough. If there were something wrong with them, they'd be DEAD. The reason I think this is important is because they are so fragile. If you're like me, your first shrimp is probably going to die just due to unfamiliarity. At the 2 LFS in my area, they sell for $16 and $18. Wal-Mart sells them for $7 and I got mine at Petco for $6. I bought my first one at the LFS for $18 and he died within a handful of days. This one is thriving and I save more than $10. Here's some additional info I forgot regarding coloration. I've read all kinds of different thoughts about the color of these things. I've read they turn bright red when happy. I've also read that they turn bright red when stressed or when death is imminent. I've made some observations regarding this because I've been paying special attention to his color (yes, I'm curious!). My shrimp was dark brown at the store but he's now red. It's possible that he was brown due to "unhappiness" but that's an awful lot of emotion to ascribe to an animal that technically doesn't have a brain (They have a system of ganglia. If our human brain were a powerful home computer, think of a shrimp as having a hand held calculator.) I thought maybe coloration was related to the environment. The tanks at the LFS where I bought mine had black walls and dark substrate in a very dark room. I have sandstone substrate and a well-lit room. I thought it might be some sort of "camouflage" reaction. However, while I'm treating my fish for disease I currently have him in the girls' bedroom in a small betta tank with black substrate and poor aquarium lighting. He's still red. There is one thing I'm convinced of - a HEALTHY shrimp will be deeply colored, whether brown, red, or whatever. If your shrimp is turning white or looking pale, my opinion is that he's either stressed, dying, or both. I've read several places that a dying shrimp turns bright red and my own observation doesn't support that. My current shrimp is red and has been since the day I got him. Now, I did own a bamboo shrimp previously (when I first got my 55G tank) and without much knowledge or him or aquaria in general, I got to watch it die. I can say with a fair amount of confidence that a DYING shrimp will turn pale or white, not red. I did observe my first shrimp turn bright red after it was but not the same red that my current, living shrimp displays. My current shrimp is translucent (yes, you can see through him to a certain degree) and tinted a deep blood red. My dead shrimp, shortly after dying, turned an opaque, bright red, similar to the color of Alaskan king crab after it's boiled in it's shell at Red Lobster. I'm assuming that's some kind of calcification process. Hopefully, this spurs a few of you to try this out. My shrimp is easily the most interesting item in my tank! For Sponge Filters which are excellent for use in your Shrimp Aquariums (regardless of type of shrimp), as these provide unbeatable bio filtration in a small space with gentle water agitation. These premium Sponge Filters also provide spaces for shrimp to hide. 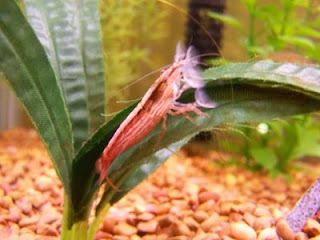 For the full Thread, Please follow this link: Bamboo shrimp anecdotes. *UV Sterilization; this is an excellent article for those desiring to lower the risk of disease in their shrimp tank, especially since shrimp are sensitive to many medications. This article starts with basics, answers many facts and myths, and provides UV bulb maintenance information too.